Plum District: $28 for a $20 Starbucks Gift Card and Two Fandango Movie Tickets! This awesome Plum Steal is back! Head over to Plum District right now and you can get a great deal! Get a $20 Starbucks gift card and Two Fandango Movie Tickets for only $28! This is a Plum Steal so you cannot use credits to buy it but it’s such a great deal even I’m going to grab it today. They had this early in the week but it sold out so don’t wait. Limit is 10 per household. *Movie tickets will be available for e-purchase in 48 hours. Starbucks can be redeemed online or in-stores. 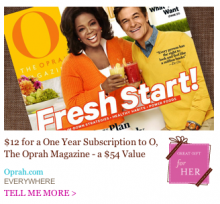 O Magazine As Low as just $7 Per Year! Plum District has a hot deal today on O Magazine. You can get a 1 Year Subscription to O Magazine for just $12. Plus, new members to Plum District get a $5 credit when the sign up and make their first purchase. With the new member credit, you’ll pay $7 for a 1 year subscription. Head over to Plum District and sign up today. *HOT* $25 Target GC Plus $50 Restaurants.com GC for only $18! Plum District has a really hot deal today that you don’t want to miss. You can get a $25 Target gift card (good online or in-stores) plus a $50 gift certificate to Restaurants.com for as low as $18! Head over to Plum District HERE and add the deal to your cart. Use code: FABULOUS to get 10% off at checkout making it only $22.50. For those of you who are new to Plum District and you sign up through this link, you’ll get a $5 credit to use on your first purchase. With those two discounts, your total will be $18! The best part of this deal is you can use your Plum Dollars on this deal, very rare for national deals like this. Head over to Plum District to grab this deal! Target Dec 15, 2011 in giftcard, PlumDistrict, restaurants, Target · Expired! Plum District: Extra 30% off through Saturday! Plum District is offering a special discount code for 30% off your purchase now through Saturday. Head over to Plum District and check out their great deals going on. Use code: LOCAL30 at check-out to get your 30% off. *This discount code can only be used on local deals in your area. Head over to Plum District to get a $30 gift certificate to use on all things baby and kids at Totsy for only $15. Sign in or sign up for Plum District (it’s free) and select â€œEverywhereâ€ as the location. Wow, this is a great offer from Plum District! This set includes the Keurig K-cup B-130 coffee maker, a 16 oz. stainless steel mug, eight assorted K-cups, home-style chocolate chip and sugar cookies, tea- and coffee-flavored hard candies, and a bag of Green & Blacks Organic Chocolates (the #1 organic chocolate in the the world!) This is a $179 value for only $129. Head over to Plum District here and grab this deal. If you are new to Plum District, you’ll get a $5 credit on your first purchase making this deal only $124! Oh my this is an AWESOME deal! Plus District is offering an exclusive Starbucks deal that you won’t see anywhere else. 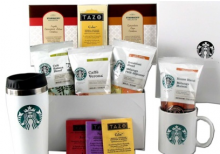 Right now you can get a full gift basket with tons of great Starbucks goodies for only $46! BUT this deal gets even better…if you are new to Plum District, you’ll get a $5 credit just for joining and making your first purchase, just sign up through this link to get your $5. PLUS, if you â€œlike Plum District on Facebookâ€œ, you’ll get a $5 coupon code to use as well! That’s an additional $10 towards this deal making it only $36! 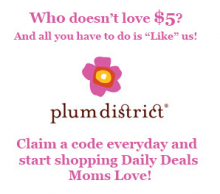 “Like” Plum District on Facebook, Get $5 Plum Dollars! Plum District is offering up a FREE $5 promo code today and every day thru Friday, 12/9! If you already have a Plum District account, just log in and look at the top right hand corner for the link to like your district on Facebook to get your $5 code. If you city is not listed, you can just click on â€œEverywhere Elseâ€ instead of a particular city. Once you have your code, just enter it at check out when you purchase any deal on Plum District. Codes are only good thru 12/11 and you can claim a code each day. Plum District: 40% off Cyber Monday code starts NOW! We haven’t even set the table yet for Thanksgiving and the “Cyber Monday” deals are coming in. I wanted to make sure you knew about this one in case you see something you really want. Plum District is offer 40% off any purchase with code “cyber40” at checkout. Plum District already offers up to 70% off so you will get a really hot deal with this code! This code is live and can be used now! Head over to Plum District here now and check out the great deals in your area and online! Daily deals Nov 23, 2011 in CyberMonday, PlumDistrict · Expired!